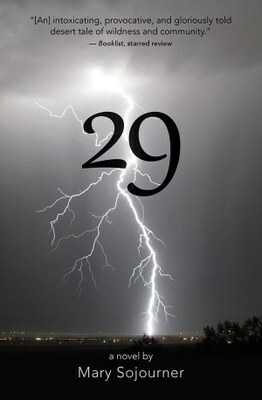 Review of “29” by Mary Sojourner. At 55, Nell Walker is ready to leave Los Angeles — or maybe just to leave, period. It’s been a year since she was evicted from her corner office, the married man she once loved is long gone, and the bank will soon repossess her million-dollar cottage in West Hollywood. Her only comfort is the vial of pills in her suitcase. But the lost woman at the center of Mary Sojourner’s new novel, 29, ends up ditching the pills and boarding a Greyhound. She lands in low-rent, sun-blasted Twentynine Palms, California, in the heart of the Mojave Desert. Here, she’ll face some of the questions she’s avoided since her itinerant childhood with a sweet but too-often-stoned mother. The land itself will change her in ways she could not have imagined. After moving into a women’s shelter, Nell turns office jockey for Monkey Burnett, a big-brained Okie pothead who fixes expensive cars for a clientele he despises. Despite their shared skepticism, the two find themselves entangled in a mystical web somehow linked to a nascent solar energy project in the surrounding desert. (In an epilogue, Sojourner provides more details about the real-life giant solar arrays springing up in the West.) The huge project threatens both tribal sacred sites and non-human life. Nell accepts a Chemehuevi elder’s invitation to join in grassroots resistance, and gradually more is revealed. The Ivanpah solar power facility in the Mojave Desert, the largest solar power plant in the world. Sojourner has worked on sacred land issues with tribes in Arizona and California for decades, and her feel for the Mojave’s geography and cultures is spot-on. By showing us Big Solar’s dark side, 29 reminds us that there are no easy solutions to the mess we’re in.